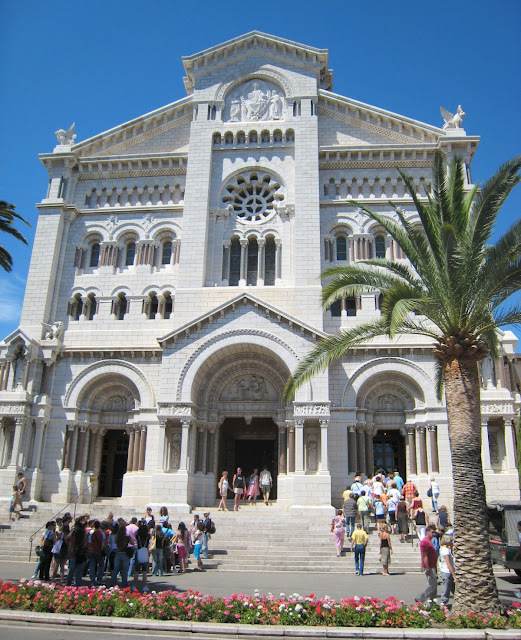 The Cathedral of Monaco, situated on Le Rocher, was built in 1875 using white stone from La Turbie. It stands on the site of a 13th century church dedicated to Saint Nicolas and houses the tombs of the former Princes of Monaco. It is also the final resting place of Monaco's much-loved Princess Grace and her husband, Prince Rainier, who died in 2005. I assume those are tourists and other visitors...I don't suppose Monaco boasts better mass attendance than France! That's huge building for the tiny Rocher! I was thinking the same thing as Isabella. It must be a hot spot with the tombs of 2 princes and a princess. I like the gargoyles! I, too, was thinking the same as Isabella and Felicia. . . .I like the white stone. Do you happen to know if they clean it often? So many times we see the effects of auto pollution on the stone or brick or even wood.